Kitchen cabinets are one of the major reasons ordinary people become woodworkers, and given how much you can pay for obviously low-quality cabinets, that's no surprise. In four intensive nights you'll build your own Euro-style floor cabinet, complete with door and drawer, to take home with you. More importantly, you'll learn how to make more cabinets, in different sizes and styles, what tools you need, how to choose and install hardware, and a bit about installation. Cabinet size is approximately 15" wide x 24" deep x 30-1/2" tall. This month we are featuring a variety of woodworking projects made by Leo Camp, who grew up in sawdust and wood chips under the watchful eye of his cabinetmaking father. This month we are featuring the carvings of Bob Edwards, who first learned how to carve 5 years ago after taking a class here at Highland Woodworking. We love to hear about the projects and fixes you make with the tools you've purchased from Highland Woodworking! This month we're featuring a dog sled project made by our customer, Bruce Wollison, with the Rikon 10" Bandsaw. This month Jim discusses eye safety within the shop and how a conveniently located pair of shop glasses will help protect your vision. Woodworking Catalog is available to browse online! Each month we're featuring one of our many spectacular Festool products and highlighting it with a video product tour. This month we're featuring a Highland Woodworking product tour of Festool Sandpaper with Steve Johnson, where he helps to calm the confusion between all of the different types. Question: What oil finish would you recommend for a Sjobergs Workbench ? This brief book, Make A Joint Stool From A Tree - An Introduction To 17th-Century Joinery , with barely 100 pages of text, has a value that far outweighs its slender size. Billed as a volume on how to make a joint stool from riven oak, the book’s subtitle—“An Introduction to 17th Century Joinery”—states its real purpose. The authors, well-known and established students and practitioners of the earliest forms of American furniture, do more than detail their methods for building a joint stool from green wood. They also relate what they’ve deduced about the methods and tools from the original period. The result is a book that combines practical woodworking guidance with valuable historical information. This month, Ira Pen has a woodworking safety tip for avoiding loose bandsaw blades. If you want to create quick and easy dovetails on your router table, the Leigh RTJ400 Router Table Dovetail Jig is the way to go. In this review, Jeff goes over the different parts of the jig, specifically their patented 'eBush' elliptical template guide, and how they all come together to create perfect dovetails. Leigh's joinery jig is designed specifically for use on router tables. Able to produce through dovetails, half-blind dovetails and box joints quickly and easily, the RTJ400 offers instant adjustment of joint tightness down to a thousandth of an inch. Poll: Do You Have a Junk Corner? This month we are featuring the workshop of Mark Davis in Glendora, CA. Quick Follow-Up and Thank You!!! Form Versus Function – The Studley Tool Chest or "How I Will Probably Offend Chris Schwarz"
This month, Steve shares his review of the Festool KAL II Syslite , follows up on his woodcarving experience from last month, discusses the twists, turns, and detours of both his life's path and wood in general, and lastly he gives his opinion on the famous Studley Tool Chest. This month, Andrea interviews Ali Harrington, who is a woodworker dedicated to building custom, heirloom quality furniture. She finds joy in creating one of a kind pieces that meet her clients needs. Ali's project for the beginning woodworker is a Cutting Board project, which she references within the article. This brand new 2015 edition of this DVD archive contains every article published in the 250 issues of Fine Woodworking magazine over the past 40 years. Easily search and view an entire generation's worth of woodworking wisdom. Touch Up Markers are very handy tools to have around the finishing area as well as in your touch up kit for onsite use. They come in a variety of colors and are easy to use. The following blog series, 'Chips from the Chisel' is John Gainey’s experience as a carpenter and joiner apprentice on the Cardiff Docks in South Wales from 1955-1960. Do You Have a Junk Corner In Your Shop? In this month's poll, Jim Randolph asks "Do You Have a Junk Corner in Your Shop?" As I neared retirement I searched around for a new challenge. During a web surfing session I came upon a site describing how to make an acoustic guitar. After reading this and other articles on the net I decided to try guitar making, after all a guitar is just a box with some hardware attached, right? That was the beginning of a yearlong project that produced my first model, a 6-string acoustic. I have a lot of "tools" that I use regularly that perhaps some woodworkers would like to know about. They are ordinary household items that I have found to be very handy to a woodworker and they are so useful that I wouldn't be without. Product Tours and Demonstrations available on our YouTube Channel! Check out the great product tour videos and demonstrations on our YouTube Channel . Our video product tour woodworkers demonstrate some of our most popular products for your benefit in these tours. Click below to watch Chris Black show off 3 different Bad Axe Saws including the Tenon Saw, Stiletto Dovetail Saw, and Small Tenon Saw. Are there any products or demos you'd like to see in a YouTube video? If so, we invite you to EMAIL US and let us know what YOU would like to see! Order any of the above 4 books from us during January/February for 33% off list price. Since 1947 IWCS has been a non-profit society, that you can join, which is dedicated to distributing information on collecting wood, correctly identifying and naming wood specimens, and using wood in creative crafts. Mortise & Tenon is an exciting new annual magazine celebrating the preservation, research, and authentic recreation of historic furniture. Far more like a book than the term "magazine" would typically imply, Mortise & Tenon is the brainchild of professional furniture conservator Joshua Klein, who lives and works in mid-coast Maine. The inaugural issue (144 pages) is currently at the printer, and is now available to pre-order. Now's a great time to save on the purchase of this legendary smooth-running, water-cooled sharpening system. The Tormek T-7 is unsurpassed for quality, versatility, edge positioning accuracy and repeatability when grinding, sharpening and honing just about every tool in your shop and home. These Woodpeckers Precision Triangles are perfect for layout work as well as calibrating your woodworking machines. Accurate to within a thousandth of an inch per foot, they are designed and built for a lifetime of reliable use. Rikon's model 10-341 18" bandsaw offers much greater cutting capacity than other bandsaws in this price range, up to 17-1/2" width and resawing up to 13" high. A special purchase allows us to offer a great deal on this popular plunge router that's excellent for use in a router table as well as handheld, while limited supplies last. For years we have tried to persuade Chris Vesper to wholesale his famous tools to us so we could make them easily available to our customers. 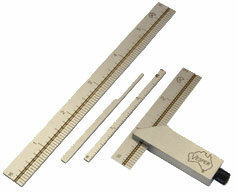 At last he has agreed to sell us one of his most popular tools, the Vesper Double Square. A true pleasure to use, the odds are great that this versatile pocketsized square will become the handiest tool in your shop. Woodworkers who appreciate hand tools that perform better than all others are discovering that Bad Axe Saws are the real deal. Known for "cutting like they're riding on rails," Bad Axe Saws are a step up from other high quality handsaws. If you need a sturdy, versatile workbench to take to the jobsite, the Blum Tool Original Bench Horse may be your ideal solution. Though the bench is truly portable (it sets up in less than 15 seconds), its leg system is rock solid, and its torsion-box top assembly is stiffer than many heavier workbenches, as well as offering exceptional clamping capacity and versatility using ordinary pipe clamps. Find more space in your workshop by mounting some of your big tools onto these handy steel mobile bases. After moving a machine into position, you can lock it firmly in place by flipping the mobile base's two quick-action levers, allowing the tool to rest securely on adjustable rubber leveling feet. Handles up to 400 lbs. Rikon's new 25-130H 13" thickness planer with helical-style cutterhead is a beefy benchtop unit designed to perform reliably either in your workshop or at the job site. Here's an excellent way to cast a powerful light wherever you need it in your shop. Switch-operated magnet mounts to any ferrous surface. 25" flexible arm allows easy aim. Copyright ©2016 Highland Woodworking, Inc.